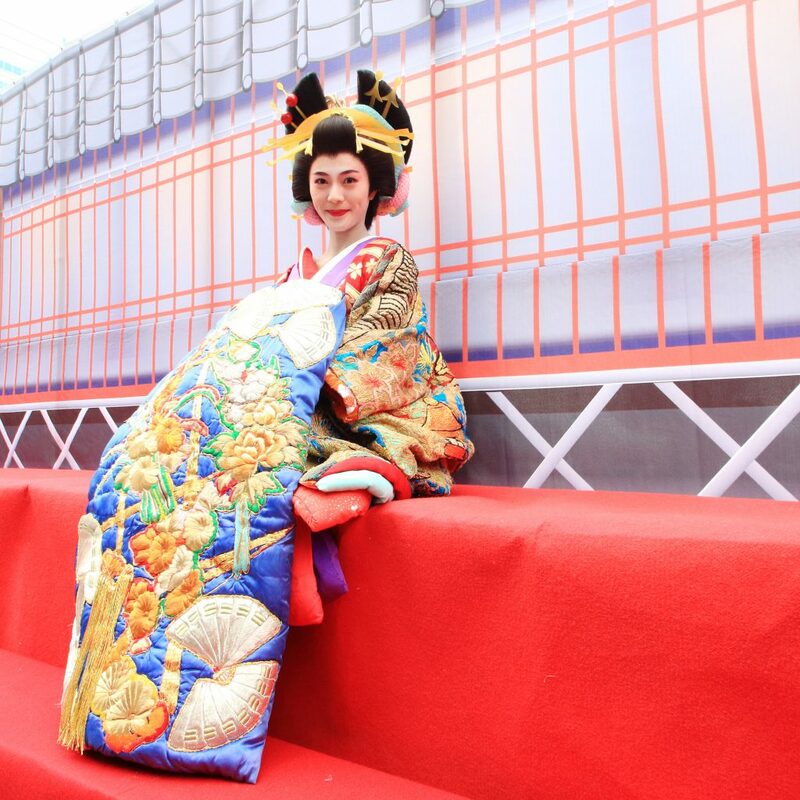 On 23rd September 2017 Rachel Leng became the first non-Japanese person to participate as an Oiran in the 27th Annual Shinagawa Shukuba Festival. We featured her in a ‘Mac on Tokyo’ interview before the parade, in which she discussed her selection and the preparation and training involved. We met up with her again to find out what happened on the day! The interview is accompanied by amazing behind-the-scenes photos from Photographer Extraordinaire Yayu Wang from Yayaland Studio. Maction Planet: Hi Rachel. Thanks for joining us again. First of all, congratulations! Rachel Leng: Thank you very much! It was such a fabulous time, and I’m so glad to have been involved in such a grand event. MP: Talk us through the day. How was the preparation and setup prior to the parade? 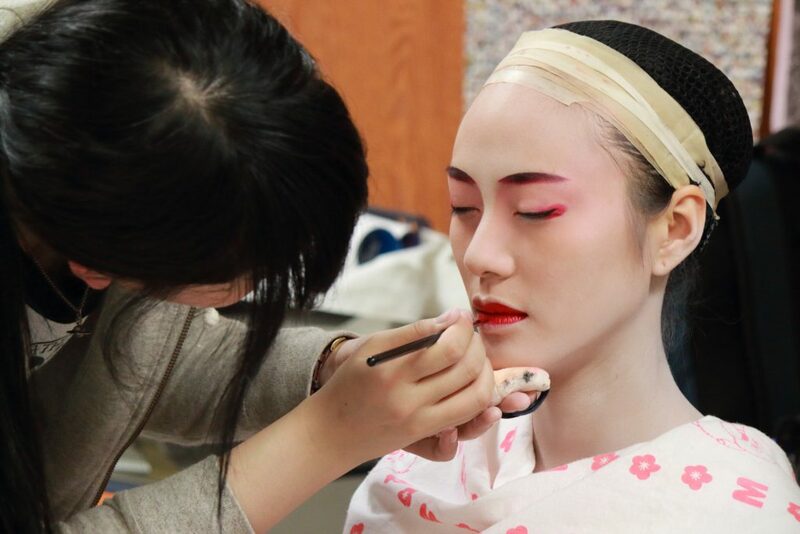 RL: The day started pretty early – all of the Oiran had to gather at 10am at the preparation building to start getting ready, even though the event itself was planned to start at 4pm. We first had to change our clothes and get into the first inner layer before we went to get our hair and makeup prepared. Everybody had to put on hairnets to keep their hair in place in order to wear the wig. Makeup took a bit longer, as the makeup base was almost kabuki-style, where we had to paint the skin on our face and down our neck white. All of us looked quite funny without any hair and so much makeup – almost unrecognizable! Then we had to get dressed with the rest of the kimonos – there were probably about 4 or 5 layers in total. At one point, I had 6 people just helping me get dressed! The last step was putting on the wig, which was really heavy (around 3kgs) and very tiring for the neck and shoulders if worn for a prolonged period of time. 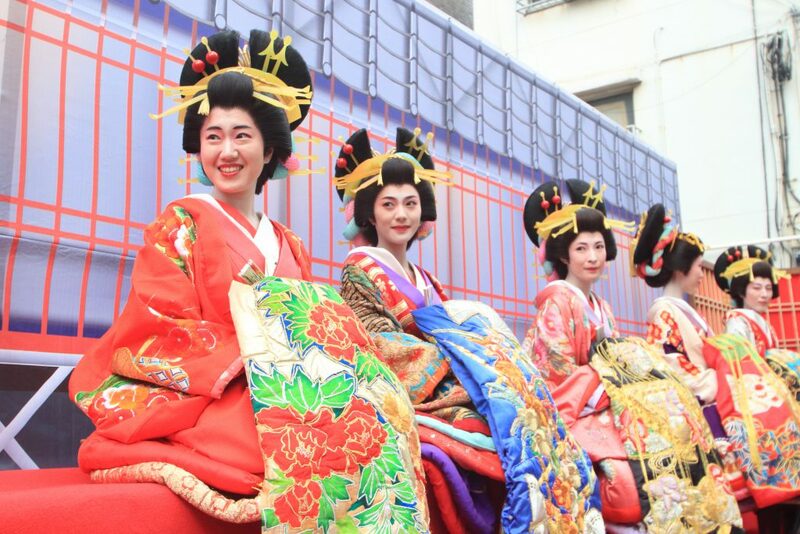 With full costume on for the first time, all of the Oiran also took some time to practice the Sotohachimonji walk just outside the preparation building. 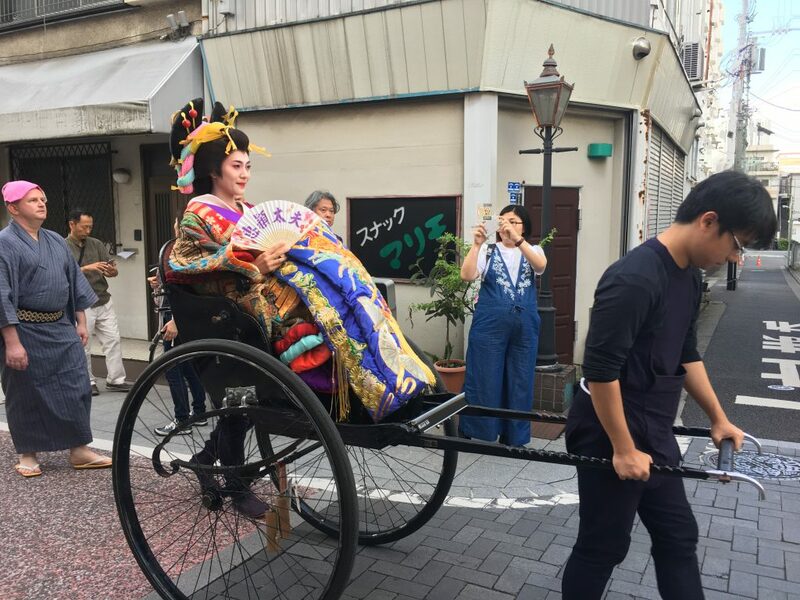 When the rickshaws arrived, each Oiran went out in turns on different routes from about 2pm to be introduced to the crowd prior to the parade. I was the last one to go out on the rickshaw, and so was taken directly to the stage where I was the first one to ‘debut’ in front of the crowds of people gathered. MP: How was the costume? It looked amazing. RL: I was surprised by how elaborate and ornamental the costumes were. It was only on the day itself that we actually saw the fully adorned wig and kimonos in person. We did not have a rehearsal in full costume, so it made me a bit nervous to do everything for the first time on the actual parade day itself. The wig was actually much heavier than I had anticipated – I kept worrying it would fall off if I tilted my head too much. For the first 3 girls, our wigs were also slightly heavier as we had some additional accessories, including a large bow at the back of the head. As the lead Oiran, my kimono was also slightly different from the others – rather than regular flower prints or other feminine patterns, my whole kimono was embroidered and there was a majestic gold temple illustration on the back, designed to pop out with the way the kimono was folded. In addition, my Tayu Musubi carried in the front was longer and much more thickly padded than the other costumes. The takageta sandals I wore were also slightly different without any tatami below the feet and also with an embossed gold ornament at the front. MP: How was the actual parade itself? RL: The parade itself started around 4:30pm, after spending about 30 minutes on the stage where all the Oiran cast gathered for a photo shoot. I was to be leading the parade as the first Tayu, and so started off first from the stage. I was amazed at the sheer number of people gathered to watch the parade! At first I was really nervous and it was a little intimidating to be performing in front of so many people… I was not fully confident in being able to pull off the Sotohachimonji walk as I had not put in so many extra hours to practice as some of the other girls and it would have been so embarrassing if I were to trip or fall if I lost my balance! 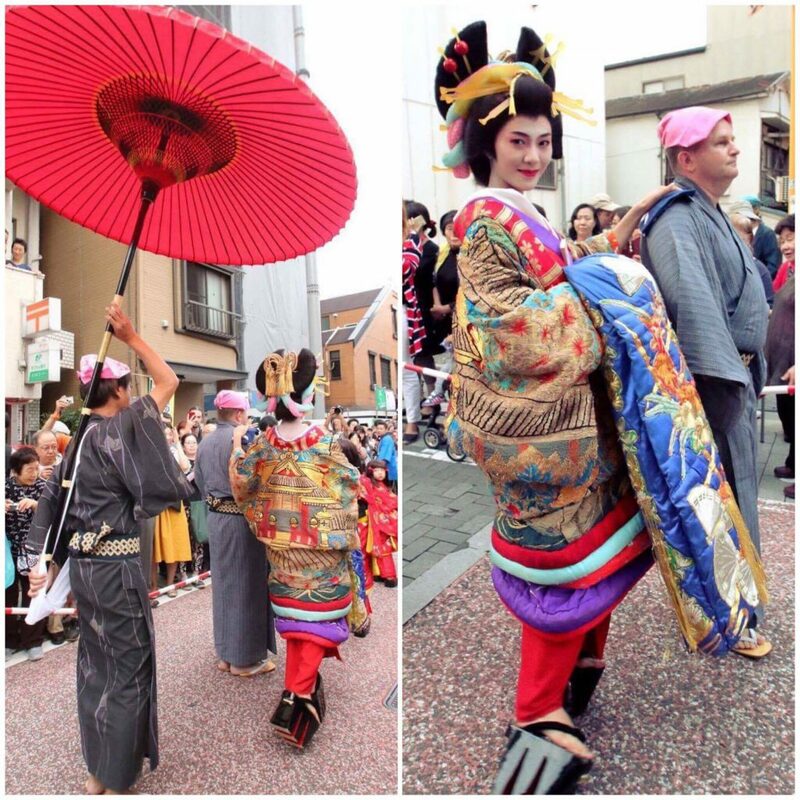 As the lead, I also had to walk faster than the other Oiran to keep up the pace of the parade. But after getting started, all my practice kicked in and it went pretty smoothly. Moreover, all the cheers and support from the crowd filled me with confidence and energy to put in my best efforts! It was certainly a full body workout and actually felt more difficult than all the photos convey. The parade was broken up into two 1-hour stints, where we had a short break to rest and refresh in between. At the end of the parade, around 7pm, we were transported to the nearby garden concert stage to take part in a giveaway which was the grand finale of the day’s events. MP: How were the crowds? RL: The crowds were pretty crazy! Honestly I did not expect so many people to be gathered just to watch the parade. The sheer number of cameras was dizzying and even somewhat disorientating with all the flash photography. Nonetheless, I was overwhelmed by all the support I received – even when I was exhausted, the cheering and applause from the crowd really gave me the extra energy to keep going strong. It made me really happy to hear people tell me that I performed the Sotohachimonji very well, and also represented the image of an Oiran beautifully. 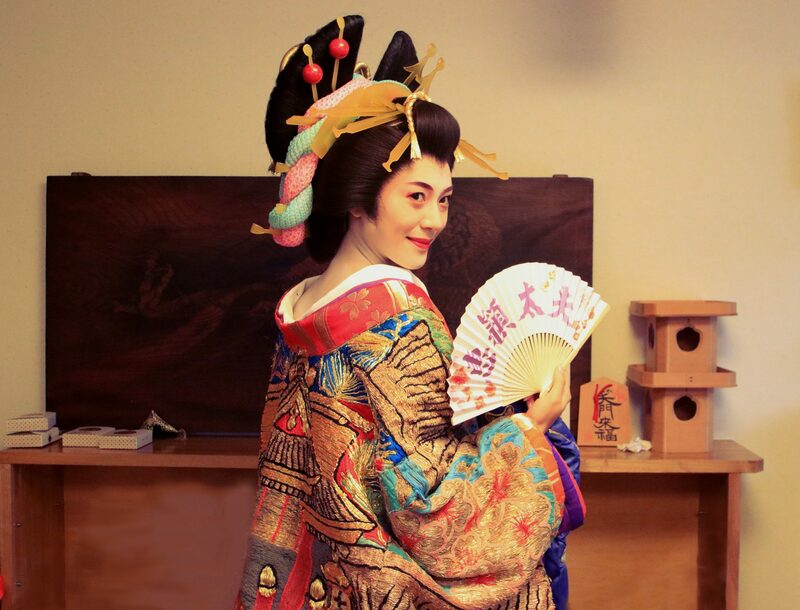 I was also really touched by people being aware and supportive of me as the first foreigner, and from Singapore – people would comment as I walked past that they really are happy to have a Singaporean be the first foreign Oiran, and that they really liked Singapore. Several people were also in the crowd holding up banners to cheer for Singapore, which was definitely a heartwarming surprise for me. MP: What was your favourite part of the day? RL: My favorite part of the day was probably the rickshaw ride prior to the official start of the event. It was more relaxed and fun, and there were less people crowding around. The activity was a lot more personable, as I had the opportunity to interact with more of the crowd when being ferried around. The actual parade later was a little overwhelming and intense with the structured procession and immense crowd. MP: How did you feel after the event? RL: It was really tiring! The events of the whole day, and walking the Sotohachimonji with the heavy clothes, wig, and sandals weighing over 15kg really takes it all out of you. The hardest part was definitely the second half of the parade. After the first hour, everybody was pretty tired already, and at the time it was intimidating to think that we were only halfway done. My shoulders hurt the most at the end of the event. The day after, my whole body was pretty sore with the various muscles that I don’t really use much in usual activities hurting, especially my legs. I actually also caught a pretty nasty cold, unfortunately, but it was worth it! MP: How was the media coverage? RL: I was really honored to have my story featured in several Japanese newspapers, including Sankei News, and even on the front page of The Japan News by Yomiuri Shimbun! 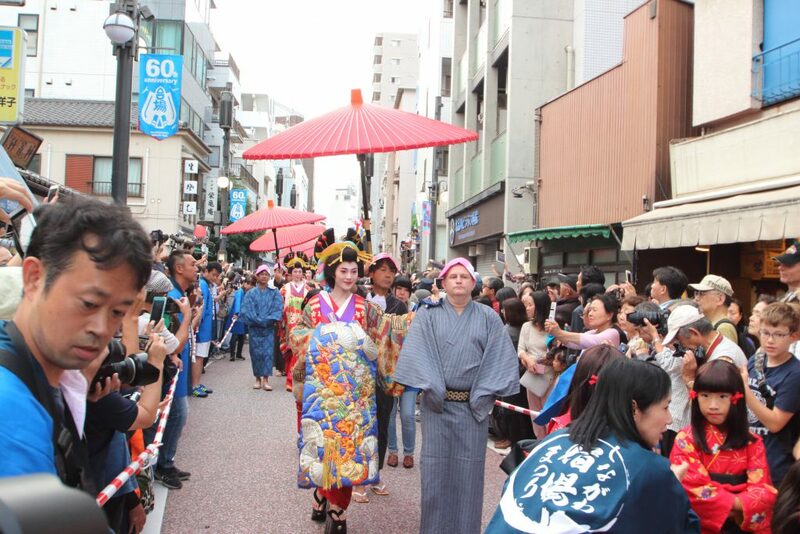 The news articles mention that having a foreigner play a key role in a local annual festival represents a great step for Tokyo to become more international by sharing the beauty and history of Japanese culture globally, especially ahead of the 2020 Tokyo Olympics. There have also been many videos and photos posted online and on social media. All of the Oiran cast are looking forward to the TV documentary produced by Shinagawa Cable Television as well. After the event and the front page article on The Japan News, the Singapore Embassy in Tokyo also extended their congratulations and support, acknowledging this accomplishment as a positive influence on Singapore-Japan cultural and societal ties. And of course, my interview here with Maction Planet was one of the first, and joining you is always exciting! MP: What does the future hold? RL: (laughs) I’m not sure, actually! I do not have any specific plans yet, but if anyone has any ideas or suggestions I’d be open to them! I really love living in Tokyo though, so am hoping to be here for some time. Perhaps I might get involved somehow in the upcoming 2020 Olympics? Who knows, but you can be sure I’ll always be challenging myself to do something new and exciting so do keep in touch and stay tuned! MP: Thanks again for catching up with us Rachel. We look forward to keeping up with your adventures here in The World’s Greatest Metropolis! You can follow Yayu Wang and Yayalandstudio on Facebook, Instagram, Flickr and on her website.